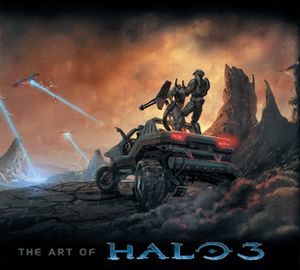 The Art of Halo 3 is a collection of concept art used for the production of Halo 3. It also includes a collection of commentary by numerous Bungie staff, and is written by Fernando Bueno. The book also includes a foreword by Marcus R. Lehto. The ordnance for each UNSC weapon is shown. It is stated, likely inaccurately, that the D77-TC Pelican troop bay is large enough to fit a modern day Abrams M1A1 Tank in it. The Guardians are revealed and have a strong resemblance to the Compilers from Marathon. Along with the cover art for Halo: Ghosts of Onyx, a full sketch of the SPI armor is included. The book reveals seven armor permutations that didn't make it past the conceptual art stage. This includes a desert camo version, what appears to be an Orbital Drop version, and a variation of the Scout, Rogue, and Hayabusa armors. Cover art in high resolution.